(2017). The static stretching, eccentric training, nano particles and biochemical enzymes (CK and LDH). International Journal of Bio-Inorganic Hybrid Nanomaterials, 6(4), 229-237.
. "The static stretching, eccentric training, nano particles and biochemical enzymes (CK and LDH)". 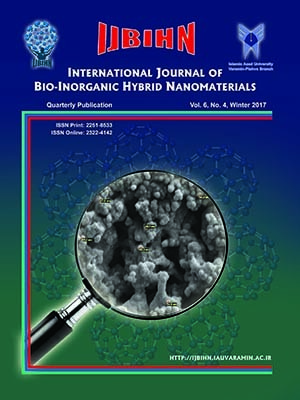 International Journal of Bio-Inorganic Hybrid Nanomaterials, 6, 4, 2017, 229-237. (2017). 'The static stretching, eccentric training, nano particles and biochemical enzymes (CK and LDH)', International Journal of Bio-Inorganic Hybrid Nanomaterials, 6(4), pp. 229-237. The static stretching, eccentric training, nano particles and biochemical enzymes (CK and LDH). International Journal of Bio-Inorganic Hybrid Nanomaterials, 2017; 6(4): 229-237. Introduction: Delayed onset muscle soreness is known, muscle pain, soreness and discomfort feeling approximately 24-48 hours after exercise. The increased serum biochemical enzymes after acute exercise or unaccustomed training were reported in some studies. The main purpose of this study was to search the effect of warm-up before eccentric contractions on DOMS, biochemical enzymes changes and Nano particles. Methods: Twenty player female volunteers were selected. All subjects were right handed and healthy. Subjects were assigned in one of two experimental group (n=10) (age: 22.6±1.91 years, height: 168.46 ± 2.91 cm, weight: 58.24±6.91 kg, and VO2, max: 33.19±3 ml.kg-1.min-1) and, control group (n=10) (age: 23.36 ±5.350 years, height: 160.81±5.16 cm, weight: 55.16±3.42 kg, and maximal oxygen consumption VO2,max: 35.1±4.71 ml.kg-1.min-1). They performed experimental protocol (80 resistance eccentric contraction) that approved by the university of ethics committee. All subjects were informed of the risks and purposes of the inquiry. Before attempt, their written consent was obtained. Blood samples were drawn from the anticubital vein before, immediately after, 24 and 48 hours after an exercise (n = 20). The study of protocol was Bruce. Ambient temperature during running was 19°C. The experimental groups, the first performed static stretching on shoulder elbow for 20 minutes and then performed incremental resistance eccentric contraction. Control group performed, only incremental resistance eccentric contraction. Results: We used mean ±SD, tables, graph, chart, ANOVA and Bonferroni post hock tests for analyses by SPSS, version 21 (P≤0.05). After analyzing, data showed an increasing CK and LDH biochemical enzymes levels in two subject’s blood. But this increase was higher in experimental group. Discussion: The results showed warm up by static stretching did not prevent not only the muscular damage cellular damage and soreness, but also induced increasing CK and LDH biochemical enzymes. Muscle sourness and weakness are acute (immediately after exercise) delayed after, 1-2 days after exercise. We approach that it is better, the first general warm up and then static stretching, because muscle fibers and membrane do not damage, destroy and don’t deplete metabolism enzymes .So we suggest using Nano particles reduce pain and soreness.